The Serial Numbers tab is where you can print barcode labels for your catalog items' serial numbers. The first panel on the tab will show the printing tasks you've queued (and the quantity of labels for each task), as well as settings for the barcode and label templates. The second panel will show a table of the serial numbers available. You can add a barcode to the list of printing tasks by toggling the checkbox on that serial number's row. Name: The name that was entered when creating the item. 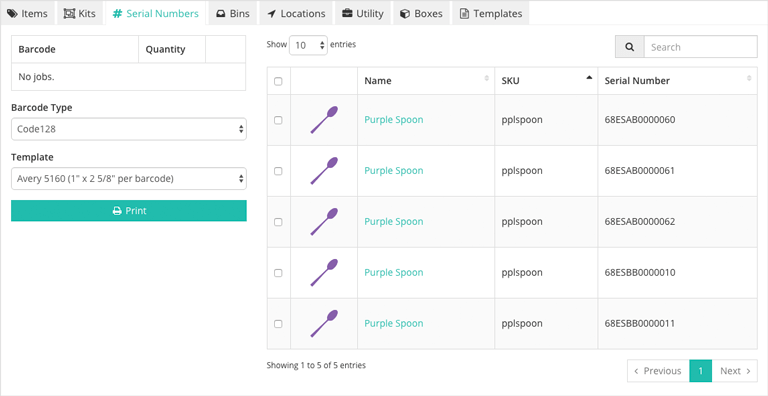 Select an item's name to open the Item page, where you can manage the listings and kits that it's connected to. SKU: The unique identifier that is tied to the item and its UPC. Serial Number: The serial number that can be used to verify a unique unit when picking orders, and for other activities such as searches and receiving.